With a five day ski tour around the corner (taking 28 kids to the mountains around Voss) I thought it prudent to brush up on some techniques. 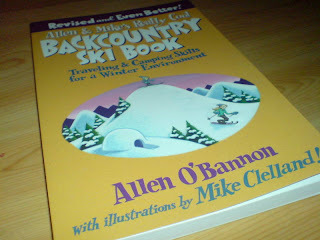 I tried to get hold of Allen & Mike's Really Cool Backcountry Ski Book: Travelling & Camping Skills for a Winter Environment last year but it was always out of stock on this side of the Atlantic. Phil reminded me about it just before Christmas and Amazon delivered my copy last week. The very first page, after I tore the packet open and sat down with a cup of tea, taught me something new and the accompanying illustration was classic Mike Clelland! (he of BPL fame), technically accurate but cute and funny at the same time. More of Mike's wide ranging artistic skills can be seen on his blog here. Allen's text is informative but also very encouraging and humorous. The book is stuffed with advice and lots of head-slapping why-didn't-I-think-of-that tips that are already making a difference to my enjoyment of the winter environment (who would of thought that ski straps would make such great emergency climbing skins!). It makes for a great read that gets important safety messages, on subjects such as cold injuries and avalanche safety, across to the reader. Highly recommended. Looking forward to sleeping in a snow hole! good luck, sounds like an adventure and half! That's got the makings of an epic written all over it! Best of luck to you- should be great fun. Be sure to pass on some tips! Kate, Titanium & Dave - thanks, 28 teenagers will be a handful but hopefully we'll all have a good time and learn a lot from the highly experienced instructors. I'm looking forward to hearing all about it! Isn't the book great? I love the illustrations and lack of preaching. Very much encouraging people to just get out there and give it a go. Phil - the book is brilliant, I'll add a bit more detail about it in the post for those who haven't got a copy. I learned new things from the very first page and, as you pointed out, I found the writing style positive and humorous. The artwork by Mike Clelland! is awesome. 5 got my copy on Friday and didn't yet have time to have a glimpse at it, though I have Mike's "Lighten Up!" and that's just awesome. Have fun with the teenagers! Hendrik - I might have to order 'Lighten Up!'. If it's half as good as this book then it'll be worth it. Curious blog posting in america??? Mike! - it's the least I could do. Everyone who ventures out in the winter should read this book.